COURSE CANCELLED: We are sorry to announce that we have had to cancel this course. Bookings on this particular occasion have been low, likely due to it being August and many people who would want to do the course being away. If you have any questions please get in touch. You can also stay updated with future courses here, and there is also the PAB website. Sorry once again for having to cancel. Venue: Willowbrook Organic Farm, Hampton Gay, Oxfordshire, OX5 2QQ. UK. 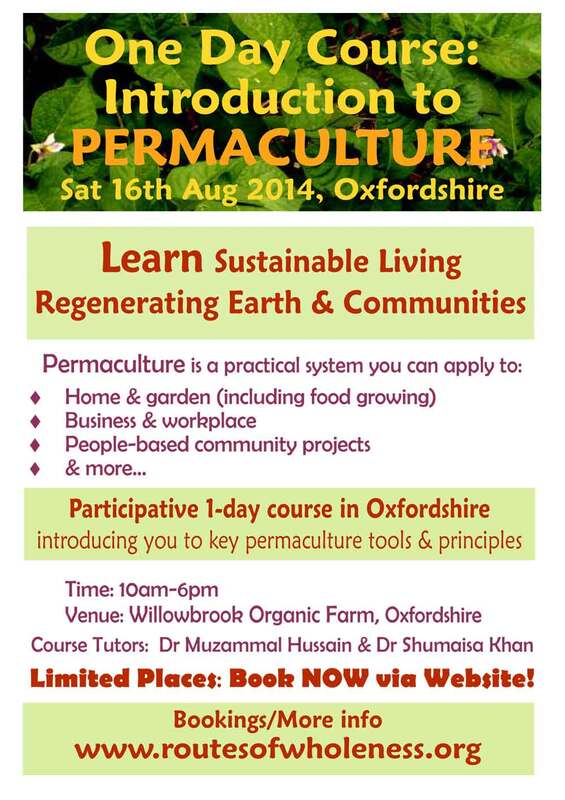 Permaculture is a practical system for sustainable living, based on observing principles and patterns in nature. By maximising relationships in living systems, permaculture has empowered people worldwide to develop dynamic, resilient projects that work with nature, rather than against it. Whatever scale or aspect of human living, whether the home and garden, community or congregation space, or one’s own life and career, permaculture can be applied to each situation. This is an interactive taster day outlining permaculture and introducing you to some of the fundamental tools and principles that can be used to design sustainable, resilient projects. Course fees £55 standard rate / £45 concessionary rate: e.g. Full time students; On benefits, State pension etc. Food: Teas will be provided; Bring snacks to share (if wished) as well as a packed lunch. This is an introductory day that promises to be fun, educational and transformative. There will be opportunities for networking with other course participants. To support a rich learning space, we are limiting participant numbers to a small group size. If you know you want to participate on the course, we recommend you book as soon as possible in order to secure your place. Transport: While we may be able to connect up participants in advance, please be responsible for your own travelling to the farm. If coming by train, bus 25A has worked well before – 10-15 mins walk from Oxford train station. (A bus journey planner is here). Alternatively, you might want to take a taxi from the train station. Closer to time, we will communicate with all registered participants, so you can choose to meet one another at the station for a joint ride to the farm (about 8 miles or 25 minutes), thus sharing travel costs! Posted on May 28, 2014, in Courses, events, food growing, permaculture and tagged courses, events, oxfordshire, permaculture. Bookmark the permalink. Leave a comment.